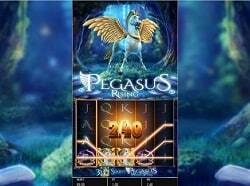 Pegasus Rising has been designed by Blueprint Gaming and it is a slot machine that’s inspired by one of the mythological creatures that the Ancient Greeks believed in. The Pegasus was a horse with wings, his father being Poseidon and his mother the Gorgon Medusa. Some of those gods and creatures are found on the reels, as symbols, along with others that are related, including Zeus and Kraken. Five symbols are sporting images of simple card logos, being used just for lower paying icons. I think that you will find the graphics in Pegasus Rising to be quite a bit of fun. The main character, the winged horse, is very well designed, and I wouldn’t be surprised if I saw that image in some high-profile animation movie. The same goes for the other major themed symbols, but the cards are very simple looking. Blueprint Gaming is not a new company, even if you don’t recognize the name. It’s just a smaller developer, but one that has been around for a number of years even before it was acquired in 2008. Right now, it’s a UK company that is part of a German conglomerate called Gauselmann Group. Games like Austin Powers, Count Duckula or Harry Trotter The Pig Wizard are good examples of slots of theirs that you should check out. This game requires that you use 50 coins, in exchange for its 40 base game lines. You can pick the total bet, out of a range of $0.50 to $50, a number of possible values being listed on the bet screen. The line bet would obviously vary between $0.01 and $1. The game gets 40 active lines on 5×4 reels, but the number can expand, just as the size of the reels does as well. You can end up with up to 80 active lines at most, during certain features. As I’ve mentioned above, the size of the reels can expand, and even though you start off with 40 lines, you can end up with up to 80 lines. This can happen during certain features which are available in the game, including the Colossal Streak and the Wild Spins. The one expanding the reels is the Pegasus Wild. Pegasus Wild symbols are used here as substitutes, symbols which will generally help you get paid more, by providing you with more combinations. These can substitute for all other symbols, without exceptions, but only if they landed in the right position first. Getting three Pegasus Wild symbols on the reels will see them act as scatters, getting you access to the Pegasus Wild Spins. For the duration of these Wild Spins, the Pegasus symbol will be turned into a sticky wild, plus it will expand the reels with more symbols. Another major feature of the game is the Colossal Streak. In order to trigger this one, you need a full stack of symbols to cover the 1st reel entirely. This feature can also result in expanded reels, with more active lines on them. 95.18% is the average RTP that is offered in this game. As for the jackpot that can be won, you have up to 200 coins that you can win inside, which obviously means just $200 cash. Pegasus Rising has been a pretty fun game to try out, with the quality of the graphics and the uniqueness of the features contributing to the experience that you get from it.